Looking for Kerala Agricultural University Vacancy August 2018? 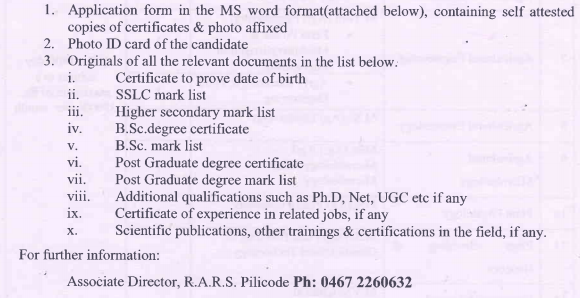 Kerala Agricultural University, Kerala has advertised for recruitment of Assistant Professor jobs vacancies. Interested and eligible job aspirants are requested to apply on or before 07th September 2018. Check out further more details below. How to Apply: Those who are interested may walk-in and appear for an interview with original and self-attested copies of certificates of proof of Educational Qualifications, Experience, Date of Birth & Age, Caste & Religion, etc at 10:00 am on 14.09.2018 at the following address. Before attending the interview, it is a must to send application in prescribed format to the given email ID. The last date to send applications via email is 09th September 2018.